"Not every 'f' means loud, couldn't this 'f' stand for 'fun'?" This was one question posed to a Sphinx Competition participant Saturday in a masterclass by Pamela Frank, concert violinist and violin professor at both Curtis Institute and the Peabody Conservatory. The masterclass was held in downtown Detroit's Courtyard Hotel. I strongly suspect that the "f" in "Pamela Frank" also stands for "fun" -- not that Pamela was all fun and games. But she certainly brought enthusiasm to harmonic analysis, as well as a wonderful ability to help students bridge the gap between technique and expression. It's gap that can grow wide in the development of upper-level technique, when so many hours get devoted to acquiring technique itself. For example, a lot of us only dream of being able to get our fingers around the wickedly technical Violin Concerto No. 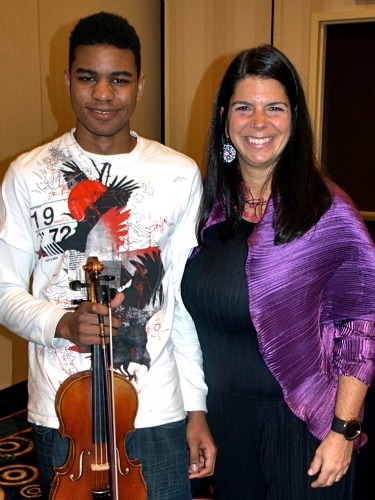 1 by Paganini, the piece that Brendon, 16, of Newport News, Va., played for Pamela. But since he had the piece in his fingers, Pamela wanted a lot more. "If I played that well, I would have a lot more fun then you are having," Pamela said. She started by asking Brendon to characterize the piece, how does it begin? "If you can't describe it, you can't play it." They agreed on "happy crazy" for the opening. How does this translate to violin-playing? Crazy can be free, released. "Free in every way: the sound and the rhythm," she said. Anything but strict, metered time. When the orchestra part is free underneath you, that is carte blanche to play around with the rhythm. "All that technique, could you use it for good and not evil?" she joked. "Play that arpeggio totally free, that's what you practiced so much for. That said, freedom has to be practiced, too. Play it 10 times differently, every day." And happy? She asked for a smile, "How about some teeth?" She kept saying silly things until he laughed, then had him play while he was laughing. She also kept poking him with her bow when he got too serious. "Did anyone hear the sound, was it different?" she asked the audience. It was: freer. They decided that another section sounded "frustrated." And how does that translate into violin-playing? Tight, fast, dense; or, slow bow, fast vibrato, more pressure. Another part of it sounded like "love." "Could you not stare at your left hand and stare it into submission?" Pamela requested. "When you practice, please practice communicating, instead of just playing." Communication has to happen between people. Play for someone. Then came the passage that I would characterize as "really fast impossible double-stop thirds." Brendon and Pamela agreed that this should sound "playful." "When you have a difficult technical passage, eliminate when is technical and just play it," she advised. In other words, to get a feel for the flow of the whole thing and to start getting the character, try it without the thirds, or without whatever causes the barrier. "You have to de-etude passagework -- every passage is a melody." She had him try it without the double-stops, aiming for a feeling of playfulness. Then, she had him try the same passage with the double stops restored, trying to keep the overall musical idea the same. "You don't save the musicality for the concert," she said, "you have to practice it." Similarly, you don't save the harmonic analysis for the concert. The two other participants played unaccompanied Bach. "Bach is not instrument-specific," Pamela told Scott, 24, of Cincinnati, Ohio, who played the Largo from Bach's Sonata No. 3 in C major. (Suzuki students, the third piece in Book 8 is a simplified version of this piece). Bach Sonatas and Partitas, though they were written for solo violin, sound good on marimba, guitar -- just about anything. "It's not about what the one instrument can do, it's about harmony and counterpoint." She asked what he felt that Bach wanted to communicate. When he started to answer, "Not…" She corrected him. "I can't work in 'not this' and 'not that,'" she said. "You can't go on stage and 'not play' this or that." First you need a mood, an atmosphere. Then you find a way to make it physically happen. They agreed that the prevailing feeling of this movement was reflective, calm. Is a super-fast, continuous vibrato calm? No. "Indiscriminate vibrato makes you sound nervous, agitated. Vibrato cannot be a good or bad habit. Vibrato is phrasing." "I'm not a vegetarian, I'm not recommending not vibrating," but as an exercise, she had him try the movement with no vibrato. It sounded very good. In Bach, harmony and dissonance dictates the phrase, with emphasis on dissonance. "If you can't find the end of your phrase, find a cadence and work backwards," Pamela said. "You have to make a sentence. A phrase is a sentence." And if you are going to a note, do a little rushing and crescendo, but don't just sit on the note to which you are going. "Sitting on the note you are going to isn't going to it," Pamela said. You have to earn sitting on it. She also got on his case for emphasizing a harmonically unimportant "F." (last beat of m. 3 I believe). "I just really like that F," he explained. "Well, just prioritize your liking!" Pamela said. "Don't give me a false arrival -- pass through anything that's on the way. Harmony is the only guide in this music." Any other effects -- sliding, the use of vibrato, amount of bow, dynamics -- should serve the harmony, in Bach. Next was Mariana, 18, of Norristown, Pa., who played the Chaconne from the Bach D minor Partita. Pamela wanted Mariana to prioritize beats in this dance movement, which has its emphasis on the second beat of every measure. "You often play three equal beats," she said. She then had Mariana do some dancing, the dip-step-step of a waltz -- another dance that is in three. Are the beats equal? No, all three have their own length. The dip of the first beat, then beat two is up on the toes, and beat three leads into back into beat one. Similarly, the beats in a Chaconne will not be equal, and dynamics and distortion of time help the performer illustrate the nature of this dance music. "Could you go to the longer note, where the Chaconne lives, on the second beat?" she said. Pamela suggested using the back of the Galamian edition of the Sonatas and Partitas, which contains Bach's handwritten manuscript. "Play the back of the book," Pamela said. "Please do not break up the slurs if the Man put them in." She advised emphasizing slurs and also playing away from Ds. "I personally play away from the Ds -- you often sit, vibrate and go to coffee on the Ds…" Try a Baroque bow, see what that does. "You need to go dancing!" Wonderful details here, Laurie! I almost feel like I was there - thank you! "And a last piece of advice…'You need to go dancing!'" F = Follow up. Please. Thanks for the wonderful report! I've been to a few of her masterclasses and love them. They were always intensely musical, fast paced, energetic, and fun filled. There were never a dull moment. In one class (on or around Valentine's day as I recall), she showed up in a pink outfit. She also wore a big heart-shaped button with a red blinking light, which kept on blinking throughout the class.